1. Dessert banana – It is sweet in taste with soft texture. Mainly used to make sweet dishes or eaten raw. Dessert banana usually has yellow skin. 2. Plantain – It is also known as ‘green banana’. Plantain has firm texture and starchy flesh. Ideal for mashing and using in dips and sauces. Banana flour is a powder traditionally made of green bananas that is often used as a gluten free replacement to wheat flours or as a source of resistant starch, which has been promoted by certain dieting trends such as paleo and primal diets and by some recent nutritional research. Banana flour, due to the use of green bananas, is noted for its very mild banana flavor raw and, when cooked, it has an earthy non-banana flavor; it also has a texture reminiscent of lighter wheat flours and requires about 25% less volume, making it a good replacement for white and white whole wheat flour. This has led to rising popularity among those suffering from celiac disease and gluten free dieters. Historically, banana flour has been used in Africa and Jamaica as a cheaper alternative to wheat flour. Banana flour is generally produced with green bananas that are peeled, chopped, dried, and then ground. This process can be completed traditionally by hand where the bananas are sun dried, dried in an oven, or a residential food dryer and then either ground in a mortar and pestle or with a mechanical grinder. The green banana process requires 8–10 kg of raw green bananas to produce 1 kg of banana flour. In recent years, large scale commercial production has begun in Africa and South America using the same basic methodology. Chile has been developing an alternative method of banana flour production using ripe banana waste. Chilean researchers have developed a process that uses over ripe banana peels to add dietary fiber to the ripe banana fruit, which does not have the resistant starch properties of green bananas. While lacking resistant starch, there are clear advantages over banana powder. Banana powder is made from dried and ground fully ripened banana puree and thus does not have the fiber of banana peel flour content nor the resistant starch of green banana flour. Banana powder is typically used as an additive for baby food and smoothies for the large amounts of potassium and other nutrients contained in bananas without the starchy properties of green banana flour. Traditionally, banana flour was produced as an alternative to high priced wheat flour in various parts of Africa and Jamaica. As early as 1900, banana flour was sold in Central America under the brand-name Musarina and marketed as beneficial for those with stomach problems and pains. During WWI, the U.S. Department of Agriculture considered plans to produce banana flour as a substitute for wheat and rye flour. 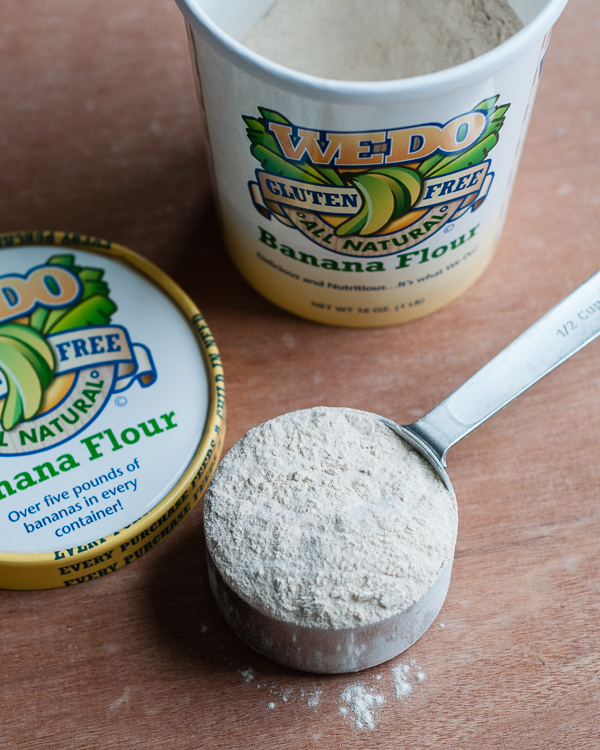 Banana flour has been imported or produced by American and Australian firms, WEDO Gluten Free and Mt. Uncle’s, and marketed by them as gluten free alternative to wheat based flours for those suffering from celiac disease and those who choose a gluten free diet. Ugandan public authorities have also marketed banana flour as a gluten free alternative and have plans for global exportation. Banana flour, in this capacity, is used not only as a replacement for wheat flour in baking, but also as a thickener for sauces and soups and as a breading for meats and vegetables. Banana flour (green variety) has gained the attention of nutritional researchers and dieters as an excellent and useful source of resistant starch (other sources include potato starch). Preliminary research has shown that increased resistant starch intake may reduce risk of obesity, diabetes, and colon cancer. Resistant starch refers to a type of starch that the human stomach cannot easily digest and thus acts similarly to soluble and insoluble fiber, in that resistant starch eases the passage of food through the digestive system like insoluble fiber while also be slowly digestible like soluble fiber. Banana flour has a high resistant starch content (17.5%) combined with excellent cooking/baking characteristics that allow it to act as a replacement for wheat flour. For this purpose, banana flour is often used raw, for example as an ingredient in smoothies, cookie, pancakes because cooking reduces the resistant starch content. However, even in cooked products like pasta, the addition of banana flour increased total resistant starch content in appreciable amounts. Banana flour is used as animal feed in various parts of the world. In particular, it is used as an ingredient in milk replacers for calves. Dynasty Banana Flour Manufacturing & Trading in the Philippines and Taj Agro Products in India export banana flour world wide for use in livestock feeds (where it acts as a coagulant) and for use in glue production, mainly plywood glue. Recipe using Banana Flour see Here and Here.